But says "give it a try"
17 lovely eggs were waiting for us in the coop on June 1 when we moved into the farm...a welcome gift from our new flock of chickens. We've been here for 13 days now, and we are deliciously exhausted...literally crashing into the bed every night. We've been digging and fencing and planting and feeding and dreaming. Lots and lots of outdoor play...while our boxes remain mostly packed inside. There will be time for all things...but for now, we live under the sun. Every day has held new adventures...we are learning so much, so fast. 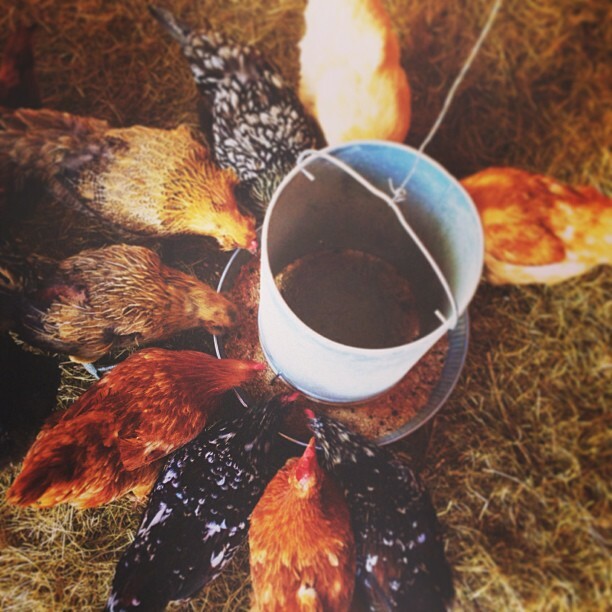 To move right into a space and "inherit" 30 laying hens is...well...pretty awesome. The magic of going outside every morning and finding our breakfast there will never get old! We have enough eggs for us and enough to sell...so if you are local, let me know! On our second day here, we said goodbye to a very mean old rooster. 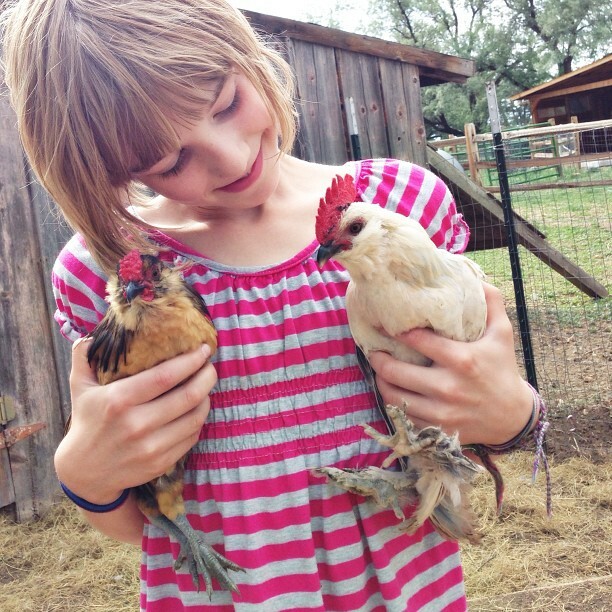 A few days later, we welcomed Tony Stark and Ironman...sweet little bantam roosters (breeds: antwerp and porcelain). The girls ADORE them. They were hand-raised and handled daily by our good friends...so they are super friendly. These four goaties are making me VERY happy. I would sit with them all day, every day if I could! We ended up getting 2 nigerian dwarfs, Cloud and Clover...and 2 nubians, Begonia and Blaster. Jet (nubian) and Violet (nigerian) will be coming to live with us after they wean in August. We'll have a sweet little herd of six...oh so wonderful. It's so fun to see Emma interact with the animals...they have a special connection :) To go from never owning even a gerbil in the last 13 years to having SO many animals is a bit of a shock, but in a wonderful way! I've had people ask if we "knew what we were getting into". Taking care of animals and a farm is no joke...and yes, we were very aware of the time commitment and responsibility, but the rewards are HUGE! Now I can't imagine how we lived for so long without animals! This is Echo, our guard llama (and our friend Mary). She is 18 years old and is an experienced goat guard. She was quite aloof when she arrived, but is definitely warming up to us. Her deep brown eyes are captivating and she is so graceful and majestic. I love her so much already. There are lots of other animals around the farm...here is a nest of robin's eggs that we found in a tree above the chicken yard. There are at least 3 other nests on our property with hungry and chirping babies in them...one is right outside our bedroom window! Lucy LOVES to hold animals and this froggy is no exception. Much to the Bella's delight, our neighboring farm has 2 beautiful horses who graze at our fences. Clothes on the line...constantly. We don't have a dryer, so I've been enjoying hanging our clothes in the sun. While we are getting settled, I will be posting a few guest blog posts, but you can find daily photos and happenings on Instagram...I use that space as a micro blog too. See you there! I read books one sentence at a time. Having three little girls means that I hear "Mama watch me!!" every 30 seconds...which makes reading a full page, much less a full book almost impossible. So tonight after supper, Matt took the girls for a bit and I poured myself a glass of wine and opened Jenna Woginrich's delicious book, "Barnheart: The Incurable Longing for a Farm of One's Own". "My God...this is all mine! For at least a year, this is all mine..." I grinned like an idiot. I can relate to her giddiness. For at least a year...this farm is all ours. And I am DEFINITELY grinning like an idiot every time I think of it! Her description of the first time she arrived at her little Vermont homestead had me riveted. Reading about the feelings she had the first time she laid eyes on her farm...I could SO relate. I just love her writing style so much and I enjoy reading throughher blog, Cold Antler Farm, as well. I have already finished Made From Scratch, which was delightful. Conversations With Farm Women, a Celebration of Beauty and Abundance...you better believe my heart started beating faster. Pitter patter...farm stories will do that to me. So will spotting an amazing barn from the highway. Or seeing a goat bouncing around. I've got it bad folks.